Back in 2014 we had the pleasure of speaking to Antoni Sendra about his then nascent ‘series of philosophical pills for the suffering souls of the hypermodern era’, Bulletproof Thoughts and the steep motion graphics learning curve he’d willingly thrown himself into. 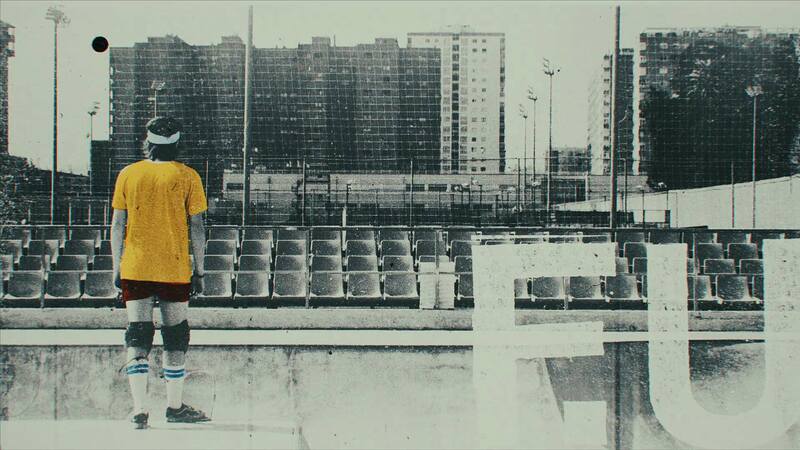 With his third instalment – featuring the sage words of skateboard legend Rodney Mullen – currently ripping up the internet, we caught up with Antoni to find out how the series has progressed over the intervening years and where it’s headed next. When Bulletproof Thoughts began in 2014 it was very much a way for you to test and implement your new motion graphics skills. Now with several years of experience under your belt, what personal creative purpose do the episodes serve? The main goal remains the same: to implement and learn new skills and please my concerns as a filmmaker. It’s a project to test, play, and surprise myself with new findings. I started it not knowing how many episodes I would make, but by now, I’m realizing that maybe I should start thinking about the series as a whole: Number of chapters, the subjects, the techniques, etc… By doing that, I’m afraid that I would loose the initial freedom that defines this project, so… I’m still struggling. I want to bind all the characters in a more clear way. Somehow, all of them are outsiders that have conquered the mainstream cultural space. They have defined the recent cultural history by not losing their individuality, but have not always been that way… Bradbury was writing science fiction at the time when that genre was slighted by high literature. Strummer, as the godfather of Punk Rock, pushed the DIY ethic in every aspect of life, and Mullen belongs to that generation of outsiders, kids that reshaped the skate and made it the modern sport that it is today. All of them are writing the future history books. How have the tools and software you utilise for the episodes developed over the course of the series? For this series I’m using the same software I was in the beginning (Adobe Creative Cloud and C4D). Handcraft procedures are also very important on these, so stop motion animation and live action are often used. For this latest chapter, I bought a Wacom Cintiq tablet which enables me to draw and design directly onto the screen. I animated hand drawings directly in Photoshop and then did the composition in After Effects. We previously discussed how you surmounted several creative obstacles during the Joe Strummer episode, were there similar challenges this time round? The most difficult problem to solve is building meaningful images and sequences to visualize the words. The content of the speeches is often very deep, and expresses concepts at an abstract level. It’s really hard to illustrate ideas like expectations, humility or failure. For this episode I started by listing keywords extracted from the speech. Then, I drew the storyboard in a very raw/sketchy style. By doing that, I was able to start breaking down the project execution: which parts were going to be cel animated, which parts were going to be shot, etc. Then, I designed the main character. I found it to be very interesting to show the character by dressing him with an old school skate look (long socks, kneepads, headband, etc.). When it comes to selecting your subjects and the particular philosophical pill to animate, how do you go about narrowing it down? That’s the core thing of the series, so I spend most of the time searching for the subject. Normally I choose the person and start a very thorough search that takes me months of internet diving. I try to find the best source that I can, by assessing not only the content, also the sound quality, the rhythm of the speech, etc. Sound design has always been a driving force throughout the series, how do you build such rich audio? I’m aware that sound design represents 50% of the piece, so I try to treat it in the same careful way as the image side. It has to be designed, arranged and mixed to communicate a clear message. Obviously, in this series the most important audio asset is the person’s voice, so all the sound design must be built under that foundation. I use a mixture of processed sounds from my library and sound recorded by myself. Music is also very important, and now I use it to emphasize certain parts of the films, rather than just as background to express a certain mood. Despite initial plans to release the Ray Bradbury episode a couple months after Strummer, it seems that the series fell into more of an annual timeframe? When do you envisage episode 4 arriving, and can we get a hint as to whose words of wisdom we’ll receive next time? I had planned to have the Ray Bradbury’s episode completed sooner, but this is a personal project I’m doing in my spare time, so… The time frame really depends on the amount of work I have at the time. I’m aware that this is not how an ongoing series is meant to be, so maybe I should change the headline. I’m also thinking about making the project more collaborative just to make it more regular. The next chapter will be about someone related to the visual field, so I’m wondering about some graffiti and street artists. I’m going to be a parent in the next few weeks, so all my energies are now focused on that very special moment.